My crafting group Yak and Yarn is one year old this month. And we are going to eat cake and celebrate! We meet at a local café twice a month (one day time and one evening meeting to cater for all). We have three core members. I am know as The Fearless Leader which makes me smile because if you know me I'm very relaxed. I set the dates and let people know via our Facebook group and email list. I also research pattern ideas for our group projects. Audrey is our Head of Charity. I started the group just as a meet up with no particular mission other than fellowship for yarn lovers. Then Audrey was asked for blankets for a local charity and so our joint projects began. After the blankets came the scarfs for the homeless and then baby blankets for a third local charity. Making things together has really brought us closer as a group and given us a sense of purpose. But there is no judgment if someone is working on their personal project instead. Roxanne is our Head of Recruitment. She has been doing an awesome job asking her friends and neighbors to join us and even teaching her friends so that they can take part too. 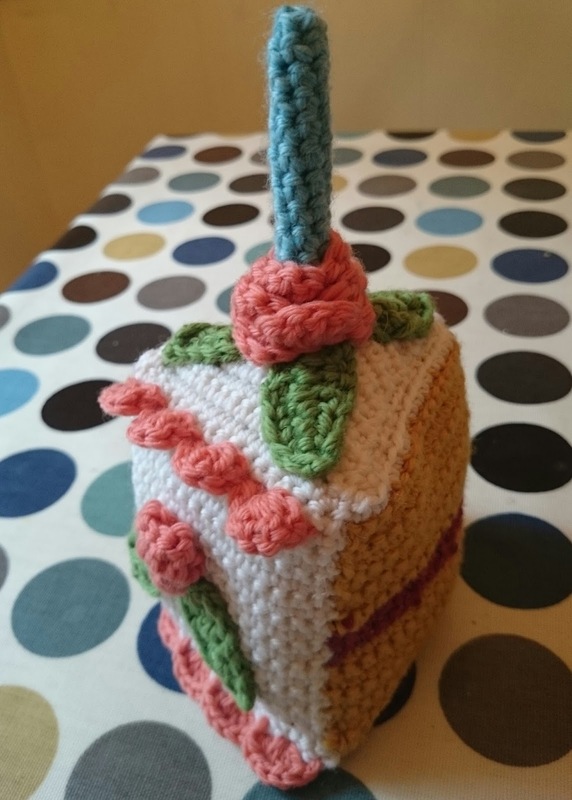 PS The pattern for this adorable slice of birthday cake by crochet designer Donna Childs came from the most recent 10th Birthday Collector's Edition of Interweave Crochet. The yarn store where I work has just starting stocking this magazine. I am SOO happy. It's just marvelous! I can't tell you how happy it makes me to see how my little pattern has been used to celebrate your wonderful group--nice work! I loved your pattern design Donna - as soon as I saw it in the magazine I knew I had to make it! I made two, one for each of my co-leaders and gave them both a slice of your cake as a surprise thank you at our first birthday meeting. They were really delighted. I had fun making the cakes too - the pattern was great, really well written. Thank you! !